Following a successful tour in Tasmania, Tasdance recently brought its program Luminous Flux - a double bill that included Tanja Liedtke’s Enter Twilight and Byron Perry’s Light Entertainment - to Parramatta’s Riverside Theatre in Sydney. Many of Sydney’s dance community were there to see this wonderful company, renowned for commissioning new works from young choreographers, present a re-staging of Enter Twilight one of Tanja’s early works. In her review, Sydney Morning Herald arts reviewer Jill Sykes wrote,Tanja Liedtke made Enter Twilight for this little company in 2004, three years before she was appointed artistic director of the Sydney Dance Company, but died in an accident before she could take up the appointment. It is an amusing piece for four dancers — three female, one male — which illustrates Liedtke’s originality, humour and rare ability to communicate at many levels through good dance that combines movement with theatricality. Three curious beings inhabit the piece to start with; their characters changing as their competitiveness for the lone male leads them to dance in a variety of styles like courting birds. Enter Twilight is entertaining, mysterious and a reminder of the great talent we lost”. Sykes, 15 April 2013, SMH. Many thanks to Annie Grieg, Artistic Director of Tasdance for her tireless efforts to bring Enter Twilight back to the stage and Sol Ulbrich and Kialea-Nadine Williams for their care and diligence in rehearsing the dancers. 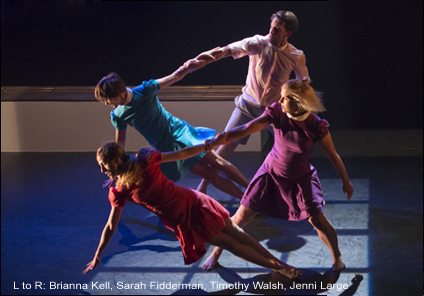 And a huge thanks to the dancers – Sarah Fidderman, Jenni Large, Brianna Kell and Timothy Walsh - who performed the work with extraordinary commitment and artistry.